SAN FRANCISCO (CN) — An engineer on Tuesday brushed off reports that substandard steel may have been used to build the $6.4 billion eastern span of the San Francisco-Oakland Bay Bridge that carries 270,000 vehicles daily. “It’s to be expected,” chief engineer Brian Maroney said of tests that found scraps of steel plates from rejected welding jobs had yield strengths lower than required by state standards. The Federal Highway Administration discovered the weaker metal when testing pieces of poorly welded steel plates intended for the bridge’s critical tower structure. The samples were found to have yield strengths typical of 36 grade steel, much lower than the required 50 grade steel. But the chief engineer said he was neither surprised nor concerned about the results. The way the materials were tested, right next to the weld in a heat-affected zone, “would affect the yield properties next to the weld,” he said. Prior material test results confirmed that steel plates in the bridge meet higher standards, he added. Nevertheless, the Toll Bridge Program Seismic Safety Peer Review Panel is studying the results, and an audit of the steel plates is expected to be made public this year. During a Tuesday meeting of the three-member committee that oversees the bridge, Maroney updated the board on an $8.5 million project to replace substandard grout, or backfill, that reinforces seismic stabilization rods. Two of the 424 anchor rods that provide extra support during an earthquake failed critical strength tests in 2015. A bungled grouting and sealing job allowed corrosive saltwater to seep into shafts and weaken some of the rods. Engineers removed subpar backfill, re-tensioned the rods, and added higher-quality grout. That project was completed in June. Engineers also installed sensors in 18 of 424 anchor rod shafts to monitor corrosion. However, Maroney acknowledged those sensors cannot detect corrosion at the base of anchor rod shafts below the backfill. In September, divers will swim underwater and use ultrasonic waves to monitor potential corrosion in 160 steel piles that stretch from the seafloor to the bridge’s sea-level support structures. Maroney said the divers will repeat the exercise every five years to monitor corrosion. But as corrosive saltwater seeps through cracks into the 8-foot-thick steel piles, Maroney acknowledged that only their exterior, not interior, can be monitored for corrosion. The chief engineer said that because the piles are sealed at the top, it largely prevents new water from moving around inside them, which would cause them to rust and weaken more quickly. Federal officials and experts have recommended using a cathodic protection system that would divert the corrosive effects of seawater from critical bridge structures to an insignificant, “sacrificial” piece of metal. Maroney has cautioned against that option, calling it costly and unnecessary. But members of the Toll Bridge Program Oversight Committee, including Steve Heminger – who has been pushing for cathodic protection – have asked engineers to explore that alternative. During Tuesday’s meeting, Heminger said U.S. Sen. Dianne Feinstein, D-Calif., has personally called him about adding a cathodic protection system to protect the bridge from corrosion. 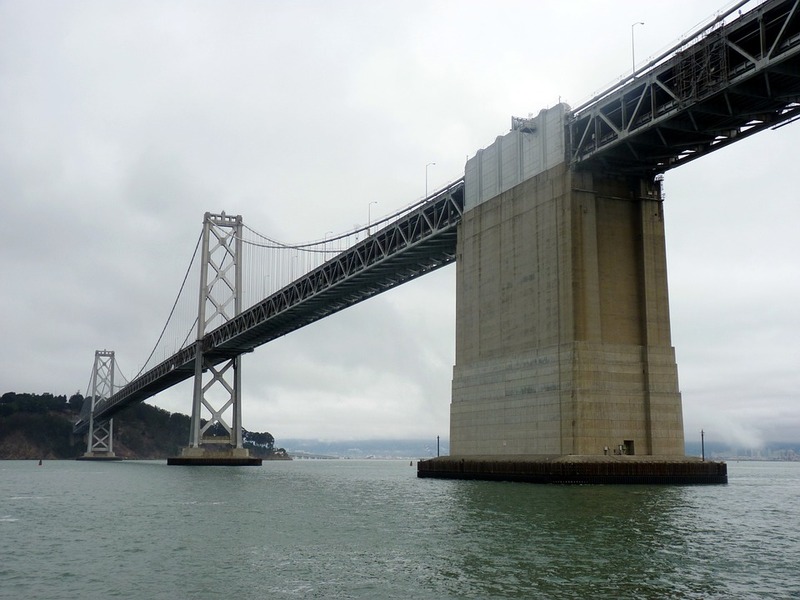 The state is spending $550,000 looking into a cathode protection system for the eastern span, according to budget documents provided to the panel on Tuesday. The eastern span of the Bay Bridge was completed in 2013, six years behind schedule and billions of dollars over budget. Critics say pressure to contain costs and meet deadlines led to poor management decisions, including the use of substandard Chinese steel. Other problems include cracks in the foundation and missing sections of deck drainage that allow rainwater to bleed inside the structure. Maroney has defended the project in the past, acknowledging there were imperfections and misses, “like on every job,” but saying that engineers have worked diligently to investigate and address the problems.